Former Manitoba Liberal MP Reg Alcock died from a heart attack on Friday. 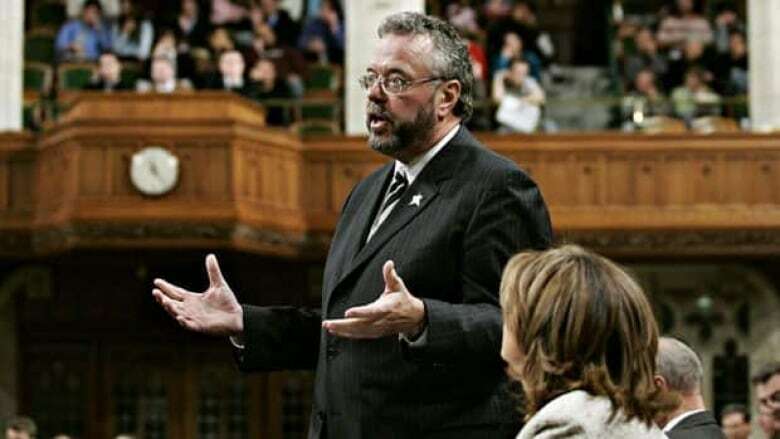 Alcock represented the riding of Winnipeg South in the House of Commons from 1993 to 2006, and was a cabinet minister in the government of Prime Minister Paul Martin. He had suffered weight-related health problems during his political career, once weighing in at 430 pounds. Facing the prospect of severe diabetes, he was ordered to lose almost half of his body weight. bobraeMP: Very sad to hear the news about my friend Reg Alcock, died of a heart attack today in Winnipeg. Great guy and good friend to many. CFIB: Sad to hear that former Winnipeg Lib MP Reg Alcock has died. He was a big believer in red tape reform for SMEs. We had many good mtgs. cljenks: Sad to hear of the passing of Reg Alcock - was sharing Hill memories of him last night. It was an honour. Sympathies to his family. During his time in government, Alcock served as president of the Treasury Board from 2003-06, and was the minister responsible for the Canadian Wheat Board during that same time. He lost his seat in the 2006 federal election to Conservative Rod Bruinooge by just 111 votes. In January 2007, Alcock was appointed to the faculty of the University of Manitoba as an executive in residence at the I.H. Asper School of Business. Most recently, he was associate dean. According to a spokesperson with the school, Alcock was preparing to travel when he collapsed at the airport in Winnipeg. Rob Warren worked with Alcock at the Asper School of Business and saw him just two weeks ago. "Poked his head in my office and he looked great. We talked about the fact he just lost 50 pounds," Warren said. "Everybody's really shocked because Reg was a great guy. He was instrumental in helping to do some redesign of how this faculty works. It's a huge, huge loss." Former Liberal MP Ken Dryden, who was in Manitoba on Friday, described Alcock as a man who didn't like theatrics and was clearly focused on his work. "He knew why he was doing what he was doing, and he knew it was important," Dryden said. "And so you would always watch Reg and you would always listen to him. I was new and Reg was among those people that I learned a lot from." In a joint release from Manitoba Liberal MP Kevin Lamoureux and Manitoba Liberal Party Leader Jon Gerrard, Alcock was remembered as "a champion for Manitoba." The Liberal family’s heart is heavy today," the release stated. "Reg’s dedication to community service in Canada was an inspiration to so many in this country." Added Gerrard: "I’ve known Reg going back to our work in the Liberal Party in the 1980s. We worked very close together when we were both Manitoba MPs in Parliament. "Reg will be remembered as a leader and true champion for Manitobans. Throughout my political career, Reg could always be counted on for help and sound advice, and was a force to be reckoned with." Lamoureux, who once served in the Manitoba legislature alongside Alcock, called his former colleague "a dear friend of mine with whom I was tremendously close. "Canada lost a champion today and is a better place because of Reg’s tremendous contributions." Lamoureux and Gerrard said they both feel Alcock will best be remembered for his key role in building the Canadian Museum for Human Rights, working with First Nations to put in place the Kelowna Accord, and holding government accountable in the Manitoba legislature alongside Sharon Carstairs. Vic Toews, a Conservative cabinet minister from Manitoba, also issued a statement and praised Alcock for his work to get the province on the federal government's radar. "During my own time as regional minister for Manitoba I have benefited from both his experience in the role and his vast knowledge of issues facing our province," Toews said. In his job with the Asper School of Business, Alcock "was able to impart much of the wisdom acquired from his many years of experience on the next generation of decision makers," Toews added. "That work has ended far too soon." "I was shocked and deeply saddened to learn this morning of the sudden passing of Reg Alcock," Bob Rae, leader of the Liberal Party of Canada, said in a news release Friday. "Reg's booming voice, extraordinary energy and great enthusiasm for everything he did was his great hallmark," Rae said. "He befriended and mentored me in the ways of public policy and I shall miss his irrepressibly candid advice."